Once a mere collection of sleepy, isolated hamlets, Shimla aka Simla in Himachal Pradesh is one of the most beloved hill stations of India today. Established during the British Era as a summer capital, owing to its pleasant temperatures and pristine surroundings, Shimla has retained its old world charm to this day. Would you believe that such a natural beauty paradise is located at a mere 6-hour drive from New Delhi and just 2 hours drive away from Chandigarh? Its location at the base of the Himalayas proper and yet close proximity to the blistering cities of the plains has made it a popular year-round destination for travellers, honeymooners and adventure enthusiasts from all over the globe. When is the best time to visit Shimla is what I will be discussing this article in detail. Why should Shimla be on your travel wish list? Renowned as the “Queen of the Hills”, Shimla packs in majestic, towering Himalayan peaks, dense, mysterious forests of oak, deodar, pine and rhododendron bristling with exotic flora and fauna, elegant colonial architecture, a World Heritage Site in the form of the Shimla-Kalka Toy Train ride and the historic Mall Road at the center of town. The pleasant, soothing temperatures allow Shimla to be a much-welcomed relief from the notoriously draining Indian summers. In addition, Shimla is one of the rare places which can be explored on foot at your leisure. Combined with mighty rushing rivers, lush valleys, crystal clear high altitude lakes and fluffy white clouds floating past, Shimla is sure to enthrall your senses. Best Time to visit Shimla? Shimla is a wondrous tourist destination throughout the year. When is the best month to visit Shimla would entirely depend on your own preference. While I will go on explaining this in more details further in the article, the months of April, May, and September are considered to be the best time to visit Shimla. These are also the months when this beautiful town receives the majority of its share of tourists. Weather at this time is perfect for spending some quality time with your friends and family while enjoying stunning vistas all around. However, if snow was on your mind than the month of January would be the best time to visit. You could go in February as well but chances of catching a live snowfall would be best in January. If you are into photography, then the months of April, September, and October will be best. You could plan in July and August too and will get even better pictures if you are ready to risk the rain. If you want to go trekking and camping then it would be best to avoid monsoon altogether. For someone who cannot stand the cold weather, visiting from October till March would be a big NO. 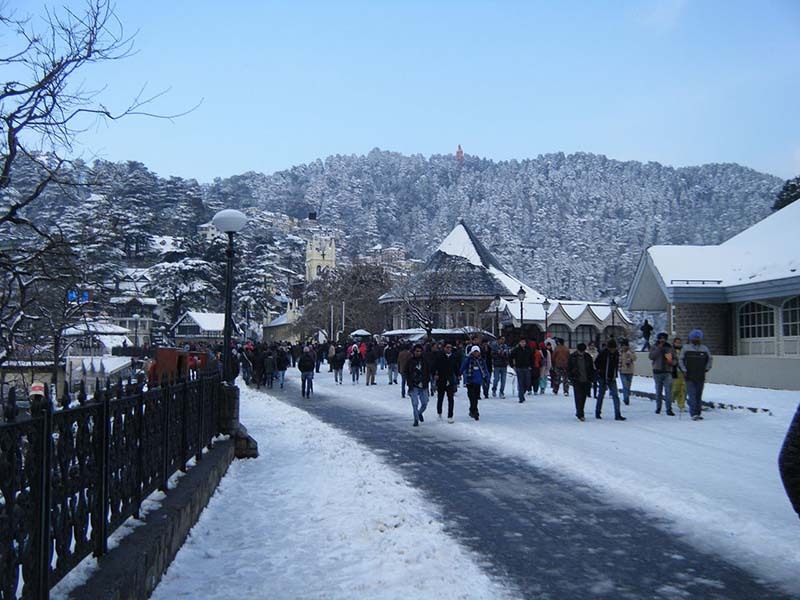 Best time to visit Shimla for snow: The months of January and early February would be best to enjoy the snow. Which is the best season to visit Shimla? Let us now explore and take a look at how the weather in Shimla trends throughout the year; and what are some of the activities you can enjoy depending on your time of visit. Dating back to the British Era, the Kalka-Shimla toy train route is one of the most charming attractions of the town. If you want a time machine to a bygone era, this is where you will find it! Imagine chugging through pretty forests and gazing over stunning vistas of the valleys below. The sedate pace of the train allows you to drink in the landscape in your own sweet time. For an intimate romantic interlude, pray with all your heart for a short, light drizzle! Tattapani is Shimla’s lesser known sister town, but is no less beautiful for it! Spread along the banks of the winding Satluj river, Tattapani is located about 50 kilometres from Shimla. It boasts hot water springs (a rare find indeed!) and gently sloping lush valleys, perfect for day-long treks. A haven for adventure enthusiasts, Tattapani offers some of the most challenging white water rafting experiences anywhere in Himachal. A couple of days here will surely recharge your batteries! Leap out of bed at the crack of dawn and head over to Glen Forest for an otherworldly experience of a lifetime. A walk through the forest and you will burst upon Chadwick Waterfall. Witness the sun rising in all its morning glory in these pristine, peaceful surroundings. Just for a time, you can imagine that you are all alone in this earthly paradise! This is a definite do-not-miss activity for all nature lovers. This nearly 2.5-kilometre trek to the highest local hill provides the perfect opportunity to test your stamina before opting for higher octane treks. From a certain height, you can cast an eye over the colonial ramparts of Rothney Castle. Do you want to soar through the air? Do you want to reach above the clouds, far away from the madding crowd? Then head out for a paragliding adventure! Kangra Valley offers just the right wind speeds and landing spaces for this exciting experience. Are you confident about heading out into remote Himalayan terrain? Want to test yourself against the elements? Then mountain biking is just the thing for you! Zip out of Shimla on a bike to ride uninterrupted through rolling hills, harsh landscapes, lush valleys and beside rushing rivers. Drink in the majestic deodar and oak forests and mighty Himalayan peaks in the splendor. This is one of the most adrenaline pumping activities in Shimla. The river Satluj rushes aggressively through the valley to create several challenging rapids. The most famous river rafting stretch runs from Chamba to Tattapani for nearly 12 kilometres. Although the activity takes about 2 hours to complete, the sheer exhilaration you feel will make you wish it lasted longer! July marks the beginning of the off-season in Shimla. The town and surrounding areas experience continuously heavy rain showers and heavy humidity. Landslides are also all too common during this period. The town’s experiences a dramatic drop in population as travellers tend to stay away during these months. If the prospect of risk gets you going, you can consider visiting Shimla during the monsoon. The rains bring out all shades of green in the forests and river transforms into an awesome, primal beast. The Rhyali Festival is celebrated by the locals to thank the Gods for the gift of rain. This time is perfect for a low budget exploration of Shimla since accommodation prices drop. The lack of crowds means you can take your own sweet time to sight-see. The scenery is most interesting and alive during monsoon. Carpets of lush green covering the mountains and made to look pretty with flowers of all colors and numerous kinds is truly a sight for sore eyes. Travellers return to Shimla to find a winter wonderland draped in layers of fresh snow especially in December and January which are the coldest months. This is the most popular period for honeymooning. Make sure to carry plenty of warm clothes and accessories so that you can explore the town to your heart’s content! Shimla boasts the best and most spectacular ice skating arena in the entire region. The rink was built during the British Era and has quite a history behind it. The ice is renowned for its stability and smoothness, and the method to create it is somewhat secret till this date. Surrounded by thickly forested hills on all side, the open air rink is protected from the warmth and of the sun. This helps the ice to sustain throughout the winter. Thousands of tourists flock to this ice skating rink to test out their skills. Gliding on the ice under a canopy of millions of brilliant stars has an unforgettable charm of its own! Are you ready to take your skiing up to the next level? Now you can get a helicopter to drop you off on a high mountain. From there, you can ski down the glorious, snowy slopes! Shimla offers some unreal opportunities for heli-skiing at Kufri and Narkanda. You can ski over miles of thick, fresh snow under a blazing blue sky. Plenty of instructors are available if you are a newcomer to skiing who teach you the methods and safety precautions of this sport. Some of the most perfect skiing locations around Shimla are at Kufri, Narkanda and Mashobra. Experienced skiers can go for cross country skiing as well. Several National level competitions are held during this time. Take advantage of abundant snowfall to have a good old fashioned snowball fight with your loved ones! Carve out snow angels; build snowmen and cities of white! Due to its high altitude, weather of Shimla remains pleasant throughout the year. The months of January and February are truly the months of white. It can snow here anytime and temperatures drop to freezing levels. Mountains all around get buried under a thick sheet of snow. This is not really a good time to visit if you are not too fond of cold weather. Snow starts to melt and is mostly all gone by March. In lower areas, it vanishes even earlier than that actually. Spring arrives towards the end of March and the next three months of April, May, and June are considered to be the best time to visit Shimla. Weather is pleasant at this time with clear skies and sunny days. In fact, it can even get a bit hot here in May and June; and you won’t even feel like you are in a hill station. July and August are the months of Monsoon and the time of green. The mountains and the valleys all around hide away behind drapes of green grass at this time. But it is also the time when rains can really spoil your trip and wreak havoc. Landslides caused by incessant rains are not a sight too uncommon here at this time. Monsoon recedes by late August and the following month of September is one of the best months to visit Shimla. Rains will all be gone but there will still be plenty of green left behind. October is the time of autumn and all that was green now turns into a golden Orange. November and December are considered to be a bad time because the weather at this time will be very cold. The scenery will be all dull and dry and there won’t even be any snow around. Below is a month by month breakdown of how temperature in Shimla trends. The average temperature of Shimla in January will remain close to 0 Degrees Celsius. Sometimes, at night, this temperature may even fall a couple of degrees below zero. The weather in February will pretty much be the same as January. Average temperature will remain between 0 to 5 Degrees Celsius. The average minimum temperature in Shimla in March goes up to around 6 or 7 degrees Celsius. Days will be pleasant at around 15 Degrees Celsius but nights will still get very cold. It does not Shimla in March or later months. Some light woolens and a good windproof jacket will suffice for this trip. Spring arrives and the weather turns pleasant. Average minimum temperature jumps up to about 15 Degrees Celsius, and days start to feel warm at around 20 Degrees. Just pack a light jacket and plenty of cottons for visiting this time. The average temperature at night in Shimla will be about 15 Degrees, but days will start to feel warm at 25 to 30 Degrees Celsius. So yes, it can even get hot around here in May. Pack a light jacket and plenty of cottons for visiting this time. The average temperature at night will start to rise up to around 20 Degrees and days will get hot at 30 Degrees Celsius. Carrying light however woolens is still advised at this time; or at least a jacket. Monsoon arrives in July and from here on, the weather remains to be wet for the next 2 months. Average temperature remains between 20 to 25 Degrees Celsius; and can go as far as 35 Degrees during the day. Monsoon dominates the entire month of August and it can rain anytime. Average night temperature will be around 20 and days will average out at 30 Degrees Celsius. Pack a light jacket and plenty of cottons for visiting this time. This, in my opinion, is the best time to visit Shimla; and anywhere in the hills for that matter. Monsoon will be gone but all that was green would still remain. The temperature will drop to 10 Degrees at night and around 17 during the day. In terms of clothes, however, you can still easily survive with cottons and some lights woolens or jackets. The weather starts to turn cold again in October; with the average temperature dropping down to 5 Degrees Celsius at night and 15 Degrees during the day. Also Read: How to Plan a Trip to Chitkul? November is not really a good month to visit Shimla. Vistas will be dull all around, there will be no snow and weather will be very cold with the average temperature at 8 Degrees during the day and 2 to 3 Degrees Celsius at night. It is the peak of winter season now with the average temperature in Shimla at around 5 degrees Celsius. While days will still be at around 10 to 15; nights will be freezing cold at close to 0 Degrees Celsius. It starts to snow in Shimla either towards the end of December or early January. For visiting in either October, November, or December, you must pack all your good woolens to help protect against the cold. A heavy windproof jacket will be a must for visiting in all these three months. In conclusion, there is really no best time to visit Shimla that can be applicable for everyone. It will all depend on what exactly your preference was. The best time is whenever you decide to set off because Shimla has a different color in each season. I hope the information above was of help. If you have any questions; or need any further details; please feel free to ask in the comments section below; or at our Community Forum; and I will be glad to answer.